Discussion in 'Auto News' started by GTPNewsWire, Oct 1, 2018. This article was published by Joe Donaldson (@Joey D) on October 1st, 2018 in the Automotive News category. I like it, looks nice! 05XR8 and JoueurGT like this. If Peugeot produces this car exactly as shown and it is not super expensive to buy, I'll definitely consider getting one. Except for the interior though. That has to be less futuristic and more nowadays. ImaRobot, 05XR8 and JoueurGT like this. ferhound and kikie like this. Dear Porsche, this is how retro/nostalgia is done right. Wow, I would be in line for this if available in the states. Such a refreshing look. Open front floorboards, apexing body lines, aggressive front styling....very well done! I wish the Detroit guys within throwing distance of my office would spend a little time looking at this. I've heard rumblings about Peugeot making a return to the US market. I'd be interested in this if they did. My family owned 3 Peugeot 504s (1 burned to the ground after the entire wiring harness turned into a toaster oven coil due to the starter motor shorting out, igniting the diesel fuel that was of course leaking everywhere, 1 dissolved into dust, 1 failed catastrophically and subsequently dissolved into dust) and 2 505s (both failed catastrophically and subsequently dissolved into dust) once upon a time and I've always had an affinity for the brand. I don't exactly know why I feel this way, but something deeply ingrained in me tells me this is the correct shape for an automobile. Simple 3-box form without superfluous detailing. It's a car...an essentially extinct form sadly. To add to this. There is some speculation going on about the new Peugeot 508 Coupé which should release in 2021. See the similarities Pricetag around €70.000. If it was 308-sized though that would be something to celebrate. The 308 platform would allow it to be quite lightweight too. It's beautiful except for the interior. It is a concept and we all know what happens to concept cars. I just saw a 1 minute long advertisement for the e-legend on a local TV channel. This must be the first time that i see a TV ad for a concept car. Why would they do that? It is only a concept car with no plans for production, AFAIK. Lots of manufacturers do this, especially Audi, VW and BMW, at least on German TV. *maybe sometime in 100 years. You know, I was going to say this car is a miss among many Peugeot's lovely hits. But after looking at the car extensively, I think this Peugeot is very cool. It is a very nice fusion of classic and modern while not entirely compromising either way. So as we like to say, "me likey." Im italian, and i saw the commercial on TV for Peugeot where they display this concept. Finally somebody smart enough to realize that is useless to keep a 2million+$ rolling concept car in a garage and finally use it to PROMOTE the damn brand. My brother in law has a peugeot SUV and was immediatly hyped to see it on TV. A friend though the car was in the dealer and went to check, came home after a drive of the new peugeot sedan. That's how you sell cars, even pretty average cars as Peugeot can be. I must have seen it four more times today, on a wider audience news TV channel. So Peugeot is putting some money in this. Could be brand advertisement, or maybe they plan to "test" the concept. Peugeot already made a production version of what was supposed to be just a concept, with the RCZ. Thing this is much different, this is using a visionary concept car to attract a wide non educated (automotive wise) crowd. I seriously never seen this before, it's usually stuff only the people in the industry care about. "We kept the best for 2019. Be ready." The e-legend adverts are currently showing here... it's gorgeous. It's got a real 70s vibe about it, really reminds me of a family friend's 5 series (504?) that we used to knock around Brittany in. Slightly drunk adults in the front, about six of us kids piled in the back. Plus ca change. That'd be its most apparent inspiration. Even the original 504 coupé is still a beautiful car. 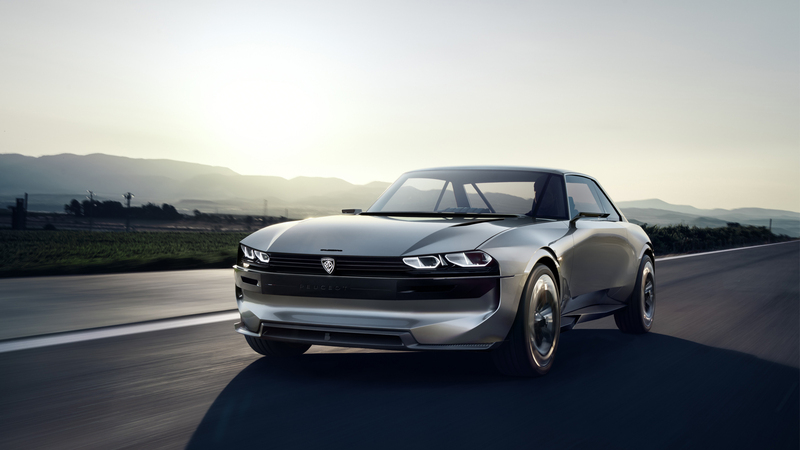 Peugeot is stupid to not make the e-Legend a production car. Since Peugeot announced its departure from the World Rallycross to focus on developing a range of high-performance, low-emission vehicles, it is increasingly likely we'll see a road-going e-Legend in the not too distant future. Hopefully it finds a respectable place in the market. .... it is increasingly likely we'll see a road-going e-Legend in the not too distant future. Hopefully it finds a respectable place in the market. And hopefully it will look exactly like the e-Legend, except for the interior. One thing I've been wondering is if it will be easier for brands without a foothold in the US market to sell electric cars here. Surely it would be easier to federalize a car if emissions are not an issue, right? There is kind of an irony here that I've noticed lately. While electric drivetrains don't feel diverse (meaning, they all feel pretty much the same with more or less output) they seem to be enabling a much greater diversity of actual cars. As the diversity of ICE-powered cars continues to shrink (single lines of modular engines, heavily shared platforms, mergers/homogenization etc) the diversity of electric cars seems to be growing wildly. Will we see another period like the first 30-50 years of the automotive industry when the number of makes proliferated? Just in the USA there were literally hundreds upon hundreds of car makers. Most of them didn't last, but it surely was more exciting/interesting than the big 3 we ended up with today. Just imagine if we had as many car brands to choose from as we do bicycles?